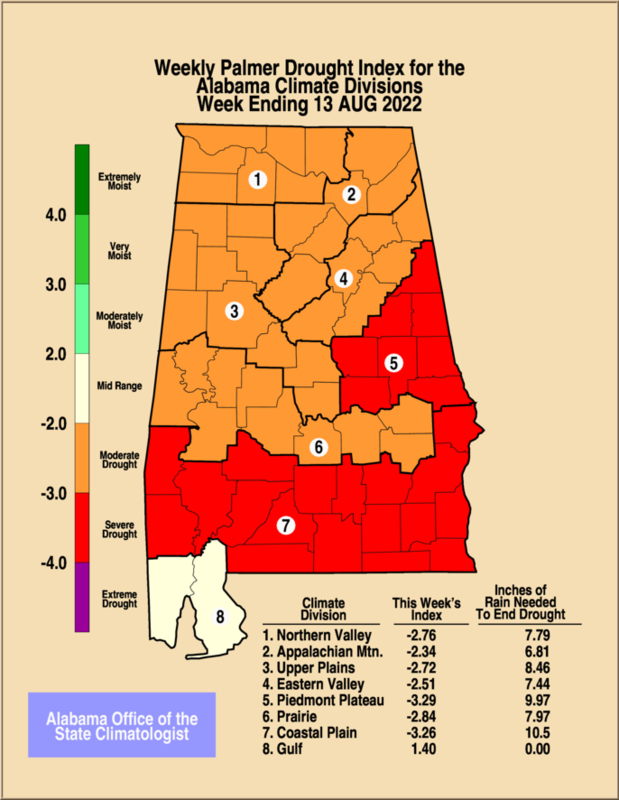 Click here for more information about the palmer drought index. The lawn-and-garden moisture index measures the capacity of current soil moisture to sustain healthy lawns and gardens. The index is computed in two stages. First, we estimate how much recent precipitation contributes to current soil moisture. We assume that any precipitation over the past 21 days should be included in the computation. We also assume that more recent precipitation is more significant than the less recent. We consider all precipitation during the previous 7-day period to be equally important, but precipitation before that time is discounted according the sliding scale shown in Diagram 1. The result is the total effective precipitation during the period. Diagram 1. The sliding scale used to determine the contribution of recent precipitation to the lawn-and-garden moisture index. If precipitation fell uniformly through a 21-day period such that the total for the period were 3 inches, then the total effective precipitation would be 2 inches. The precipitation we use to compute the index is obtained from NOAA's Climate Prediction Center. It is determined from weather radar images in conjunction with precipitation reported at rain gages. Second, we find out how much the total effective rainfall for the current day differs from a "standard" amount of rainfall considered to be adequate for that time of year to sustain healthy lawns and gardens. The difference is the lawn-and-garden moisture index. Of course, much less precipitation is needed during the cold months than in the warm ones. 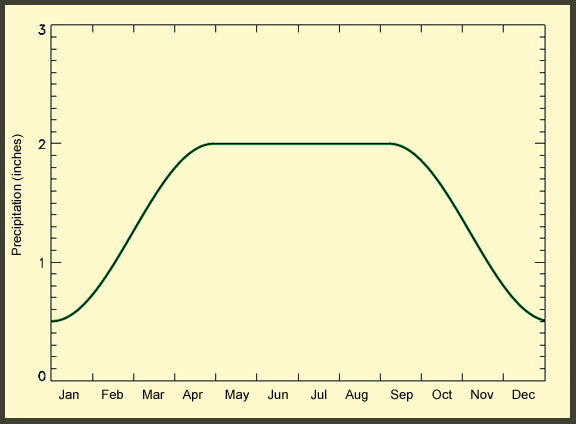 The curve in Diagram 2 shows the standard amount we assumed throughout the year. In the coldest time of the year, about 1/2 inch is considered to be enough; in the hottest, 2 inches. If the total effective precipitation on January 1 were 1 inch, then the index would be +1/2 inch for that day, but the same amount on July 1 would give an index of -1/2 inch. Thus, positive values of the index indicate adequate precipitation or better. Negative values indicate a precipitation deficit. Diagram 2. The curve used to estimate the standard amount of precipitation is considered to be adequate to sustain healthy lawns and gardens. The curve shown in Diagram 2 does not work equally well for every part of the State. In parts of the State the soil is loose and drains rapidly. In other parts, the soil has the ability to retain moisture for longer periods of time. Also, different grasses, shrubs, flowers, and garden crops have differing moisture requirements. However, the curve is good enough to provide a general idea of the parts of the State receiving enough precipitation to have attractive lawns and productive gardens and those that are not.